Phase II of the 1065 Tremont Street development will feature a new 6-story, 31,500 square foot building containing 28 apartment residences. Apartments will include 5 1-bedrooms, 9 1-bedrooms with studies, 3 2-bedrooms, 7 2-bedrooms with studies, 2 3-bedrooms, 1 4-bedroom duplex and 1 4-bedroom duplex with a study. 4 apartments will be designated affordable. No vehicle parking spaces will be constructed as part of Phase II. 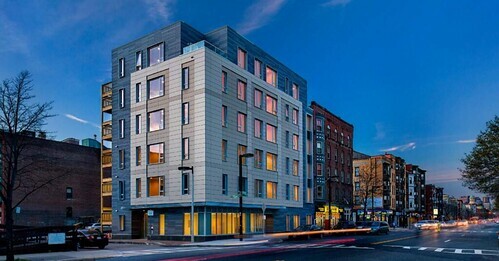 Phase I of 1065 Tremont Street, a 6-story, 16,200 square foot building, opened in April 2016 and features 16 apartment residences with a ground-floor commercial space. The Phase II building will be adjacent to Phase I. 1065 Tremont Street is located steps from Northeastern University and the Ruggles rapid transit station. The Haycon team is in process of siding install for the second phase of 1065 Tremont Street. Haycon is utilizing CavityRock insulation panels on the project to increase thermal efficiency. When complete 1065 Tremont Phase II will add 28 high-end apartments to the 16 already completed in Phase I. The Tremont location is just blocks from Ruggles MBTA station and Northeastern University. Haycon continues work on their 1065 Tremont Street Phase II project in the South End. With the windows in place, including large bay windows, it's easy to see that the residences are going to offer ample sunlight. This upcoming 6-story building will include 28 apartments, ranging in size from 1-4 bedrooms. As the development is located near several MBTA bus and subway routes, the transit-oriented project does not contain parking. Haycon successfully delivered the first phase of 1065 Tremont Street in 2016. Their experience as a construction manager, architect, and owner covers not just multi-family residential but, luxury homes and commercial projects. With winter fast approaching Haycon is working to get their project on Tremont Street weather tight. Crews are completing window install and glazing on the 6-story, 31,500 square foot project. The building will contain 21 residential units ranging in size from 1 bedroom to 4 bedroom duplex homes. Phase 1 of 1065 Tremont was completed in 2016 and features 16 units and ground floor commercial space. The project is conveniently located in the South End, just minutes from Northeastern University. Haycon Construction continues work on framing at 1065 Tremont Phase II in Boston's South End. This 6 story building will feature 28 apartments ranging from 1 to 4 bedrooms. The first phase of the project, a 6 story, 16 unit apartment building was completed by Haycon in 2016. Phase II of the 47,700-square-foot 1065 Tremont Street mixed-use development in the South End has received final approval from the City of Boston’s Zoning Board, giving general contractor Haycon the green light to start construction. The 31,500-square-foot Phase II building will feature 28 apartment residences and will be located next to the recently completed 16,200-square-foot Phase I building, which features 16 apartment residences with ground-floor commercial space. Developers Boston Real Estate Collaborative and Urban Core Development propose to expand their 1065 Tremont Street development in the South End, constructing 28 new apartment residences next to the 2016-built Phase I building. The developers have filed plans for the Phase II building with the Boston Planning & Development Agency (BPDA), who is now reviewing the proposed project.